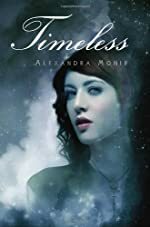 Review: Timeless is an inviting book that turns out to be an amazing book, written by Alexander Monir. In this book the main character, Michele Windsor, has a very sad tragedy occur to her at the beginning. When Michele's mother is taken away, her life is turned upside down, but she grows as a person, Timeless shows that people can overcome any obstacle that is tossed their way. Also, Timeless' is a modern-day romance, and because of all the mixed emotion in the story, Timeless is an incredible book because of all the mixed emotions. Timeless is an inspiring and motivating story of a young girl who wasn't who she thought she was. Michele Windsor once believed she was an ordinary girl that had a rich family she was never allowed to meet. Before Michele was even born, her dad mysteriously disappeared and no one knew what happened to him. After tragedy takes away Michele's mom she goes to live with her grandparents that she has never even met. It is not long before Michele gets the impression that her grandparents don't like her, possibly because they didn't like her father so why should they like her? Also she learns some information about herself and her father that she never thought that she would know or even existed. She also meets a lot of her relatives in a way no one would ever believe. That is because what she can do hasn't even been discovered by scientists. Never in a million years did I think that Timeless would be one of the best books that I have ever read. That is because Alexander Monir is a very descriptive writer. For example she wrote, "The glass revealed a girl identical to Michele with the same chestnut hair, ivory skin, and hazel eyes; even wearing the same color of dark denim jeans and black tank top." That piece was only just from the second sentence! That goes to show how good of a descriptive writer Monir is. This is because it is only the first page and you have a really good feel for the story. The way the book develops is amazing. Timeless reminds me of a time when I read the Twilight series and realizing Jacob and Bella could never be together. That how it was the same with Michele and Philip. Philip is Michele's true love, but tthey can never be together. So to sum it up this book is amazing, because of the story development and the very descriptive writing. So go out and by this book so you understand what this story is about. We would like to thank Random House for providing a copy of Timeless for this review. Have you read Timeless? How would you rate it?